Wasps and hornets are pests only when their day-to-day routine is interrupted by humans, usually withs no warning to the wasps. Wasps and hornets rarely sting just for fun. It is when someone approaches their nest quickly that they get agitated and can become dangerous. Almost all confrontations between people and wasps and hornets involves a human trying to remove a nest or a child using the nest for target practice. Wasps and hornets are among the most valuable insects on our property if we are looking for help in controlling pest insects. Wasps prey on large quantities of harmful caterpillars and flies which they feed to their young. If you have wasps and hornets living someplace on your property, you are unlikely to have any serious fly problems; they wasps will keep them well in control. Unfortunately these insects often build their nests near occupied dwelllings and may become a nuisance or even a danger if a person is allergic to their sting. 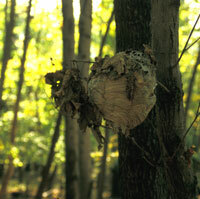 Paper wasps hunt all kinds of caterpillars to provide food for their young. They will hunt cabbage worms, tomato hornworms, tree loopers, and most all of the pest caterpillars found in the home landscape. They will nest in your yard if you provide adequate shelter. Build some small boxes, about 6 inches square, and leave them open at the bottom. Paint them brown or black and fasten them to stakes placed in sunny areas. The wasps will build nests inside the boxes. Like honey bees, wasps are social insects. This means that they can occur in large numbers in the same nest. Because they are present in large numbers, the only effective control is that needed is to locate the destroy the nest.